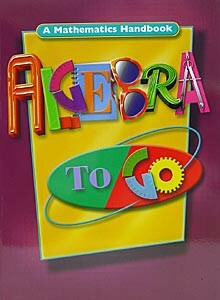 Algebra To Go, A Mathematics Handbook by Great Source. The ultimate math resource for school or home, everything you need for math success. Includes a handy Almanac with math prefixes and suffixes, study tips, guidelines for using a graphing calculator, test-taking strategies, helpful tables, and more. Softcover. 523 pages.